On Wednesday morning, the New York Islanders signed yet another one of their 2008 draft selections to an entry-level contract. 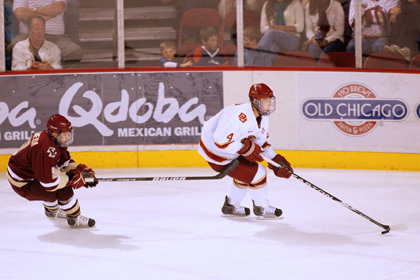 Matt Donovan, who spent the last two seasons defending the blue-line at the University of Denver, inked his deal. While his entry-level deal will not kick in until the 2011-12 season, Donovan will report to the Bridgeport Sound Tigers immediately, where he will play the remainder of the 2010-11 season with the Islanders American Hockey League affiliate on an Amateur Tryout Contract. In his sophomore season, Donovan surpassed all other Pioneers defensemen in scoring, posting a career-best 32 points (9 goals, 23 assists), bypassing his 7 goal, 14 assist freshman season by 11 points. The 20-year-old said he owes a lot of that improvement to his coaches at Denver. Now that his collegiate career is over, defenseman has started to look towards his future. He knows his transition to the Arena at Harbor Yard will be seamless, especially since he’s friends with Rhett Rakhshani, who has been selected to the AHL’s All-Rookie Team, and Aaron Ness, who signed his entry-level contract with the Islanders franchise last week. While Donovan’s excited to get started, he knows this is just the beginning for him.